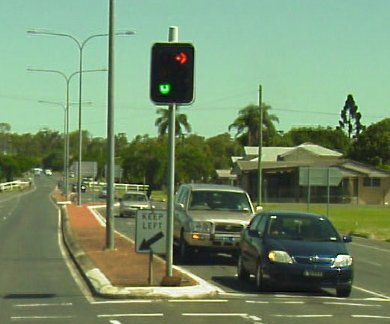 A Traffic Light (or traffic signal) is an electronic device positioned at a road intersection or pedestrian crossing that regulates the flow of traffic through the intersection or at the crossing by variously displaying to motorists and pedestrians either; a red, amber or green light (or symbol), indicating which vehicles and/or pedestrians have right of way at a particular point in time. The sign below is a traffic light advanced warning sign. The useful life of traffic signals will vary considerably due to a range of environmental & other factors. A useful life of 25 years appears to be typical for the traffic signals operated or investigated by the organisations listed below. Section 8.3.29 of the Data Standard for Road Management and Investment in Australia and New Zealand deals with traffic signals.